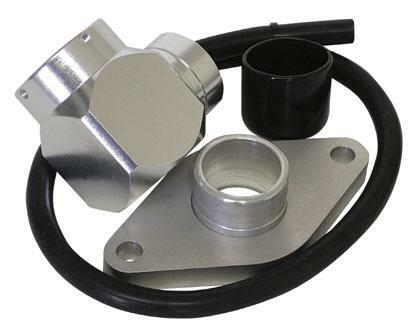 Turbo XS Blow Off Valve Accessories - Dezod Motorsports Inc - Home of the automotive performance enthusiast since 2002. Gotta get that Turbo XS BOV Installed somehow, and with a complete line of accessories, Turbo XS makes your life that much easier. 90 degree elbow for Type H BOVs allows you to mount your valve parallel to your intercooler piping when space is limited. Mounts to Type H weld on adapters at one end and into Type H BOVs at the other. NOTE: The H-90 Elbow is all that is required to mount the Racing Bypass Valve Type H34 to 1995-1999 ECLIPSE GST/GSX when you vent the valve back into the intake. “T” piece for installation of our Type H BOV; Type H-RFL BOV; Racing Bypass Valve Type H34; or Racing Bypass Valve Type H into 1.75 or 2.00 inch diameter hose. Made of mild steel and powder coated black with raised “swages” on either side for secure installation. Adapters which allow you to mount a TurboXS Type H BOV or Type H-RFL BOV to a GReddy Type-S or HKS flanged intercooler pipe. Blow Off Valve not included.